This article is about World 10-3 in Super Mario Maker for Nintendo 3DS. 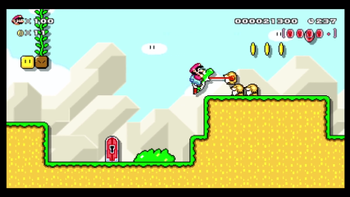 For World 10-3 in Super Mario Maker, see Bowser Retreats, Mario Advances. World 10-3 is the third level of World 10 of Super Mario Challenge from Super Mario Maker for Nintendo 3DS. It is the same as Yoshi's Island 2 from Super Mario World and 1-2 Remix (Yoshi) from Super Mario Maker. Pink Coins now replace the Dragon Coins of the original, which gives a little bonus room, and the Jumping Piranha Plant is in the level. However, Hammer Bros. and sound effects of the Wii U version are also present. Goomba - Collect all Pink Coins and then reach the goal. Bowser - Use a shell to get at least seven lives in a row and then reach the goal. This page was last edited on June 29, 2017, at 22:47.